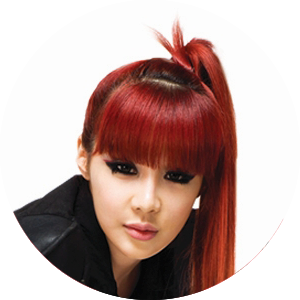 Bom was born in Seoul, South Korea, as the youngest daughter. She has an older sister, who is the famous cellist Park Goeun. Bom moved to the United States of America when she was in middle school and studied there from sixth grade on. That might be the reason why she speaks English very well. She later majored in psychology at the Lesley University in Cambridge but decided to follow her dream to become a singer instead and enrolled at Berklee College of Music before coming back to South Korea. Bom auditioned for YG Entertainment and SM Entertainment many times but failed before she was finally offered a trainee position at YG Entertainment after three years. Bom is known to be very sensitive, yet to have a 4D personality, which means that she has unusual and creative ideas and might interpret situations completely differently. It is also said, that Bom used to be a sleepwalker. Bom said her biggest influence in music was Mariah Carey, which is a great fit as they both have very strong and powerful voices. Park Bom was very active even before 2ne1 debuted. She was featured in her company seniors’ song “We belong together” and “Forever with u” by BigBang. She was also part of Samsung’s group project called Anycall, which also featured Lee Hyori, Gummy and G-Dragon (BigBang). Bom released two solo songs, “You and I” and “Don’t Cry”, which gained much success and even won her first place on the Korean Gaon Digital Chart and the Best Digital Single Award at Mnet’s Asian Music Awards in 2010. However, Park Bom is on a hiatus and disappeared from the public since 2014, when she was caught up in a scandal. She was investigated by the Korean police for importing drugs after she received a package from the USA including medicaments, which are not allowed in South Korea. She explained that they are meant to be used for her medical treatment and therefore wasn’t prosecuted or charged. Many people claimed that she used her celebrity status in this issue and kept criticising her. We love Park Bom in the MV for "It hurts"! All pictures on this page were shot by Republic of Korea and made available under the Creative Commons License. Sources for this profile page are Allkpop.com, Wikipedia and own research.